Antti-Teollisuus' Purchase Manager Tapio Arjasto (left) and Project Manager Toni Leino observes the cabin door production at Kaununki. The small village of Kanunki is located in the middle of an idyllic rural landscape in Finland. To everyone’s surprise, the village is home to cutting-edge industrial know-how with strong global demand. The village is part of the city of Salo, where former mobile phone giant Nokia famously had a plant back in the day. Salo is also known as the home of Antti-Teollisuus, a slightly different kind of company with years’ worth of experience in global trade. Over the course of its 65-year history, Antti-Teollisuus has manufactured practically everything one could possibly need while running a farm. Back in the 1960s, the family company developed its first grain dryer. During the following decades, grain handling solutions became their core business, and a strong one at that. 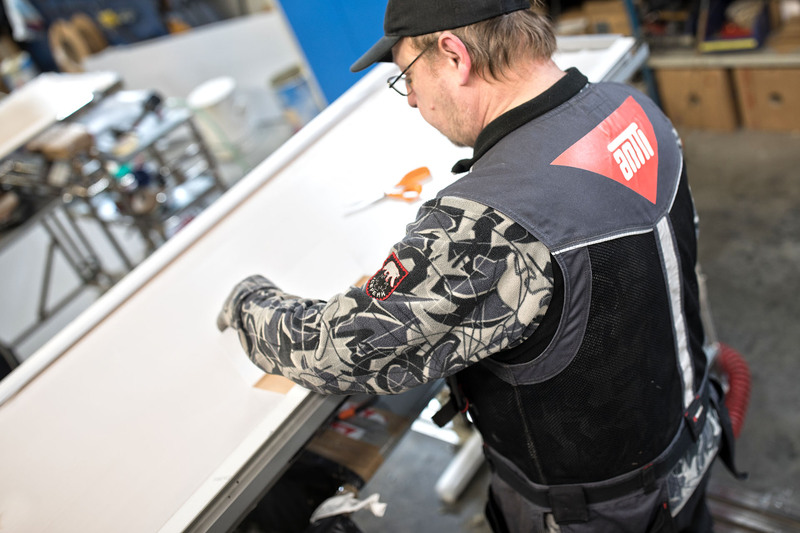 It was at the beginning of the 1990s that Antti-Teollisuus took its first step towards the marine & offshore sector and began to manufacture cabin doors. Today, the sector forms an important business area for the company, second only to the agricultural industry. Most of the doors delivered by Antti-Teollisuus are specially designed for ship cabins. In addition, the company also delivers doors for accommodation modules used on offshore oil rigs. The measurements and design of practically all doors are customized to meet each customer’s individual wishes. Just to make sure, Class B and C do not refer to the luxury level of the passenger’s cabin. Instead, the class is a reference to the door’s fire safety rating. Class B doors can handle a fire for up to 30 minutes, while Class C means that the door is made of materials that have been tested and proved to be fireproof. Depending on the year, Antti-Teollisuus manufactures 12,000 to 15,000 doors annually. Out of those, up to 90% are cabin doors with high requirements placed on sound insulation. Even more important than that, however, is fire safety. All marine equipment must be Wheel Mark Certified, or in other words proven to be fireproof. This is the reason why the paths of Antti-Teollisuus and FinnProfiles originally crossed. Their cooperation began in 2003, when fire safety started to raise its head in the marine & offshore sector. “At that time, sealing was not tested for fire safety quite as much as today, but we nevertheless decided that we wanted our doors to be completely fire safe, including their sealing. FinnProfiles took on our challenge,” recalls Niemi. There are two sealing profiles in the doors manufactured by Antti-Teollisuus: the frame seal and the brush strip seal. The former seals the space between the door and its frame, while the latter is located between the door and the threshold under it. The goal was to find a solution that would be not only fireproof, but also as soundproof as possible. Leino was impressed by FinnProfiles’ dedication to meet its customer’s needs. He says that FinnProfiles spared no effort in making sure the end result would be a sealing solution that perfectly matches the customer’s wishes. In addition to fire safety, another goal was to find a solution that would form a good seal between the door and the threshold but that would neither make the door too difficult to close nor result in too high a price tag for the profiles. In short, the doors were to be as soundproof as possible, but also convenient to use and cost-effective to manufacture.